Located just outside Orange City, Blue Spring State Park (www.floridastateparks.org/park/Blue-Spring) is ground-zero for manatees during the winter months. 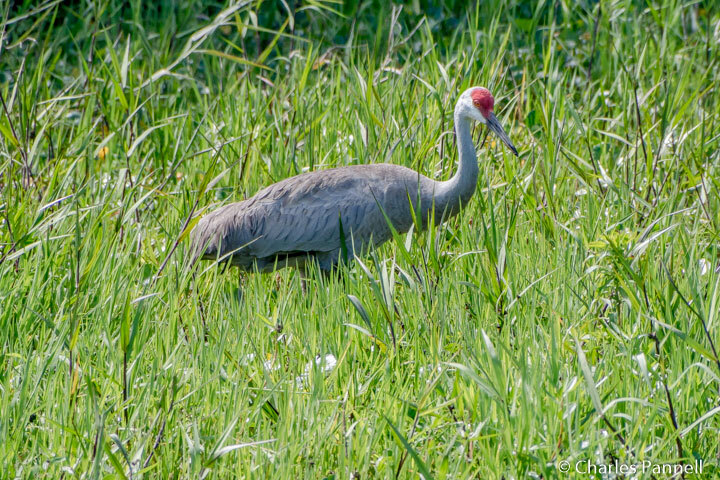 And although the massive mammals are a sight to behold, there’s an abundance of other wildlife located in and along the adjacent St. Johns River. Rental kayaks are available for visitors to explore this area on their own, but the most accessible way to take it all in is to hop on a St. Johns River cruise (www.sjrivercruises.com). The dock is easy to find. Just follow the main road from the park entrance all the way to the end. Along the way you’ll pass the campground and a picnic area with a playground, before the road dead-ends in the lower parking lot near a second picnic area. Accessible parking is available in the lower parking lot with ramped access to the St. Johns River Cruises ticket booth. From there, a level boardwalk leads out to the dock where the Native II is moored. There are several steps up to the boat, but lift access is available for folks that can’t manage them. Best of all, it’s a mechanical lift, so it’s not dependent on a power source and it’s very easy to use. 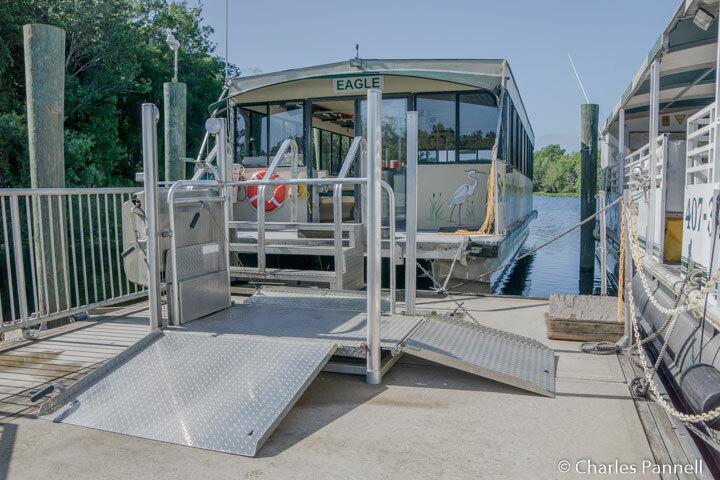 Thanks to the lift, wheelchair-users can board the boat easily in both high and low tides. The average cruising speed of the boat is a very mild six mph, and wheelchair-users can stay in their wheelchair or transfer to a seat. The bathroom on the boat has a wide door, but because the toilet is on a pedestal, it’s about 36 inches high. Best bet is to use the accessible restroom next to the picnic shelter before boarding. 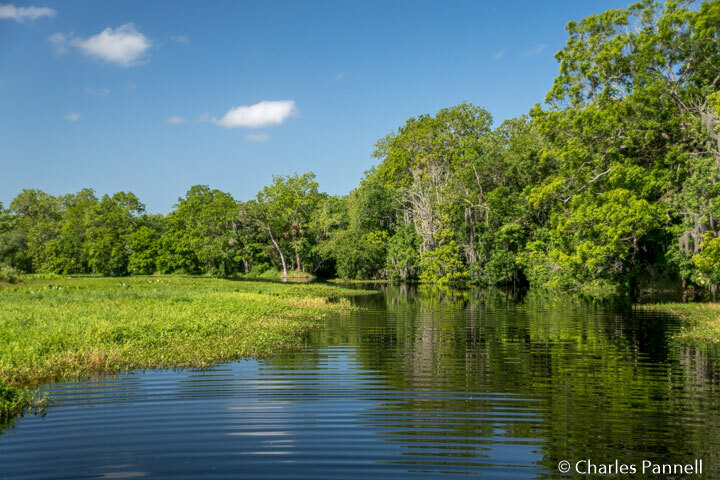 The two-hour tour travels along eight miles of the St. Johns River and circles two islands. Along the way a naturalist points out the wildlife, and moves in for a closer look whenever possible. The Native II was created for shallow water, so it’s possible to get pretty close to shore; and since the engine is quiet it doesn’t spook the wildlife. 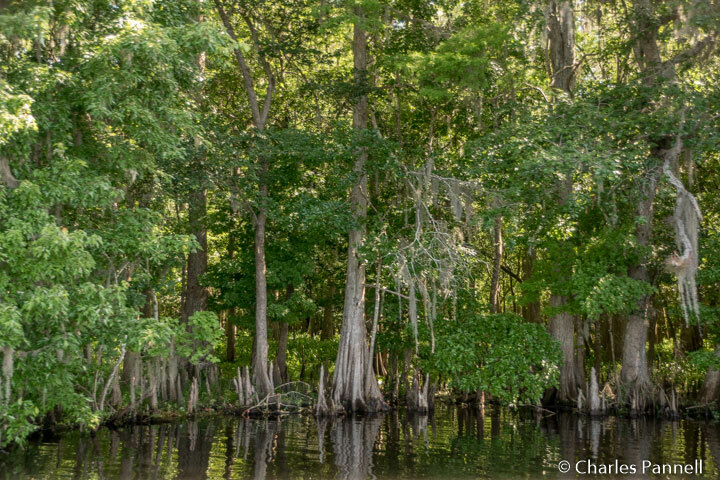 Expect to see white-tailed deer, turkeys, herons, and lots of gators on the tour. 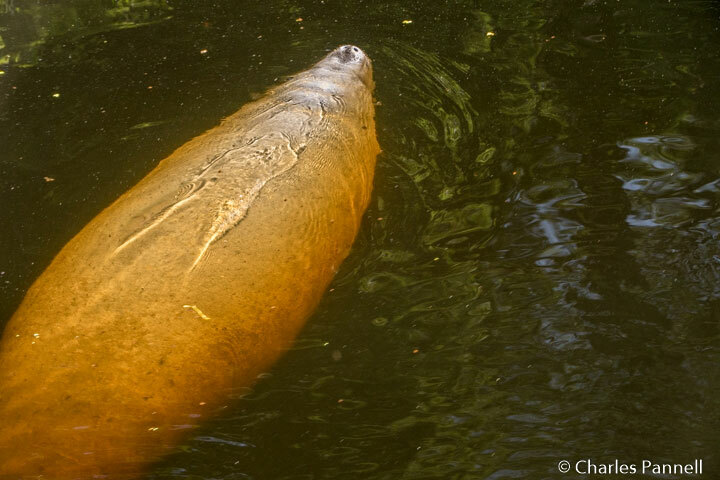 Be on the lookout for trails of circular bubbles too, as that usually indicates the presence of manatees. The naturalist has a good eye for spotting these, and if you’re lucky you may even catch a glimpse of these magnificent animals when they surface for air. The morning cruises are usually less crowded, and the animals are also more active earlier in the day. And if you want a discount on your cruise ticket, make your reservation on-line. You don’t have to pay for the tickets until you pick them up, and an advance reservation also guarantees you a seat on the cruise, which usually sells out during the peak winter season. Either way, plan to include a St. Johns River cruise on your next Northeastern Florida itinerary. You won’t be disappointed!